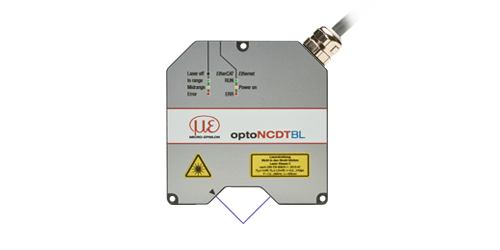 The optoNCDT BL models are equipped with a blue laser diode and are used when standard sensors with a red laser diode are operating at their performance limits. Due to its shorter wavelength, the blue laser does not penetrate the target surface, projecting a small light spot on the surface and therefore providing stable and precise results. As Blue Laser sensors are equipped with a special filter, they are insensitive to highly emitting objects such as glowing metals. Blue Laser sensors are preferably used with measurements on organic and (semi-)transparent objects, as well as for red-hot glowing metals. The optoNCDT2300-2DR is the new model in the high performance optoNCDT 2300 range. The beam path is designed for direct reflection and will find applications in the measurement of high-gloss, shiny and reflecting surfaces. Blue Laser technology from Micro-Epsilon and its optical arrangement result in a laser sensor that is extremely sensitive to changes in distance, which enables very high measurement accuracies. The new model is used in consumer electronics production (e.g. smartphones, tablets and displays), industrial applications and for the production and processing of semiconductors. The new technology Blue Laser allows the sensors, absolutely precise and reliable measurement results on red-glowing metals and glowing silicon. The blue-violet laser offers decisive advantages. Even in the case of measurements being effected on organic matters such as veneers, wood, or skin, the blue laser makes an important contribution regarding precision. While allowing more stability, the blue laser light does not penetrate the measuring object due to the reduced blue-violet laser. 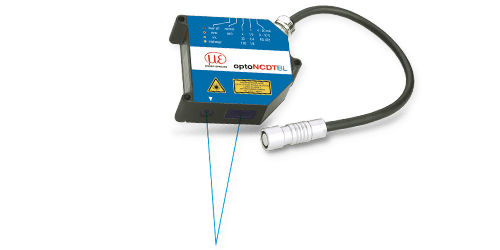 Blue Laser sensors belonging to the series optoNCDT 1700BL are designed for fast distance, displacement and position measurement on red-glowing metals. The sensors are equipped with new high-end lenses, laser control and evaluation algorithms. The new Blue Laser technology enables absolute precision sensing and reliable measurement results on red-hot glowing metals and glowing silicon. The blue-violet laser offers decisive advantages. The blue laser helps to achieve high precision for measurements on organic materials, such as veneers, wood or skin. The short wavelength blue-violet laser prevents light from penetrating the measurement object, and the light is much more stable. 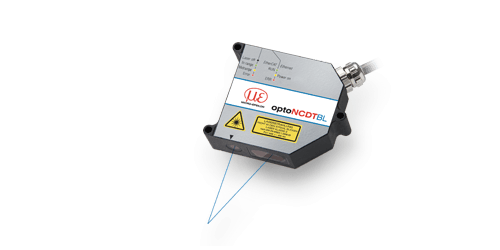 The high quality optoNCDT 2300BL series operates at a measurement rate up to 49kHz and is therefore ideally suited to precise measurements of fast moving objects. As the controller is integrated into the sensor housing, the sensor is suitable for mounting in restricted spaces. The system is operated via a web interface that is addressed via an Ethernet interface. This web interface allows making settings for the processing of measured values and signals, e.g. peak selection, filter and masking features for the video signal. 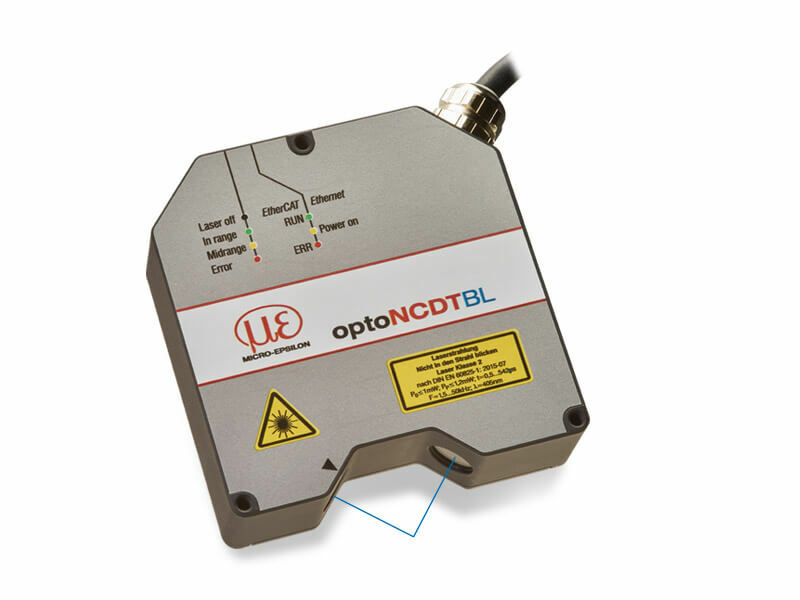 The optoNCDT 2300-2DR high precision laser triangulation sensor is designed for measurements on reflective and shiny targets. Due to the blue laser light, the measurement signal is extremely stable, which means the sensor is able to measure to nanometer resolution. An extremely small laser spot size enables reliable detection of very small objects. The sensor is for example used for thickness measurement of flat glass, assembly monitoring of extremely small parts and for distance measurements on annealed glass. The system is operated via a web browser that is addressed via an Ethernet interface. This interface enables the user to make settings for the processing of measured values and signals, e.g. peak selection, filtering and masking features for video signals.